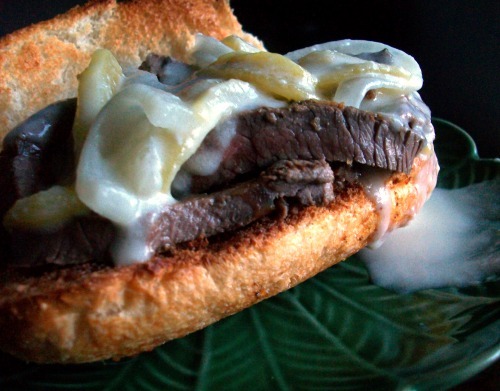 Tex-Mex Cheesesteak | Tasty Kitchen: A Happy Recipe Community! Tangy Tex-Mex twist on the yankee classic. In a bowl, mix together lime juice, garlic, cilantro, salt, and pepper. Then whisk in the olive oil. Ta-da! Marinade! Add the meat and toss around to make sure it’s nice and coated. Cover tightly and refrigerate for at least 4 hours. A little less than four hours later, we make cheese sauce! Saute your chopped onion and chiles in a saucepan with some butter or olive oil (just a smidge), until they’re translucent and tender. Then remove and set aside. In that same saucepan, melt your butter. This ensures all that onioney/chile flavor is in your sauce from the start. Add the flour and whisk together. 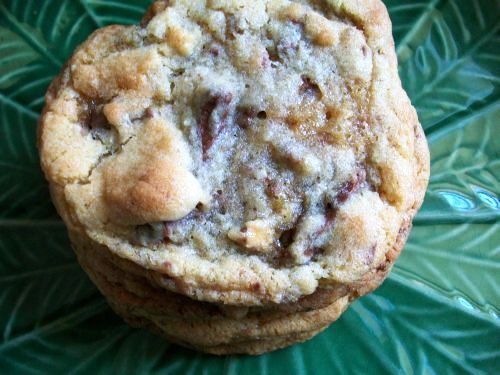 Let this cook for a couple minutes to get the raw-dough flavor out of the flour. This will thicken up your cheesy sauce. Next, add the milk. Stir to combine and get any flour lumps out. When the milk is heated, add the monterey jack cheese. The cheese will melt, but will resist incorporating in the sauce. Don’t let it sass you. Whisk whisk whisk until all the cheese gives up, lets go of the whisk, and becomes sauce. Reduce the heat and simmer the sauce for about ten minutes, letting it thicken up. This would be a good time to consider cooking the meat. Heat up a grill pan or nice, big skillet. Get it really screamin’ hot. Then just toss your marinated meat right onto it. Don’t worry about oiling the surface – your meat conveniently has olive oil all over it! Cook the meat just a few minutes on each side. The idea is to get a good, flavorful sear on the outside while leaving the inside nice and tender. Once it’s done, set the meat aside to rest. And once rested, slice it up. Add the sauteed onions and chiles to your thickened cheese sauce. Stir until happy. Slice open your sammich rolls and stick them under the broiler for a few minutes, until nice and toasty brown. 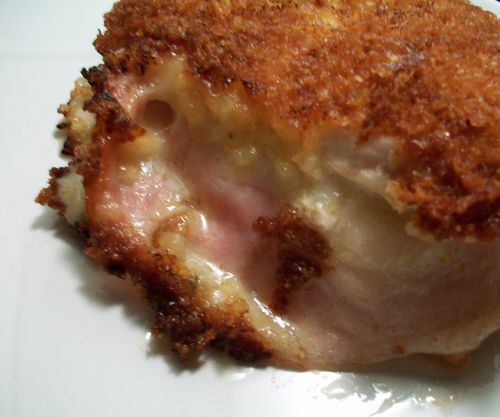 Pile high with meat and slather in delicious cheese sauce. This sandwich was so delicious! I was unsure of only having the cheese sauce as a condiment, but I needn’t have been skeptical. The sauce was delicious with a wonderful flavor. The tender meat with the sauce and soft bread got rave reviews around our dinner table (my 1 and 3-yr.olds gobbled it up!) My only problem was that my cheese sauce separated, but I think it was because I didn’t whisk it enough in the beginning stages. Delicious!